In this case, poker is not a metaphor for thermonuclear war or anything else. It is a social convention. As a rookie detective in Warsaw, Indiana, the newbie is expected to lose money and listen to the stories of the crafty veterans to gain from their hard-earned experiences. Unfortunately, he will only have one night of lessons to apply before he is abducted by a serial killer in Greg Francis’s Poker Night (trailer here), which releases on VOD and in select theaters this Friday. Jeter made a name for himself breaking a big case, but at least one of the grizzled detectives is not convinced the whippersnapper deserves his seat at the table. However, the legendary Det. Calabrese (played by Ron Perlman) is in his corner, so end of discussion. Each of the four greybeards relates an anecdote with practical applications that Jeter will realize over time, as he languishes chained up in the hooded maniac’s customized basement. Much to Jeter’s distress, his captor is also holding Amy Maxwell, the daughter of his least welcoming colleague, with whom he has been carrying on a dangerously flirtatious but not yet criminal relationship. He quickly draws his first conclusion: his predicament is not random. It is personal. Poker Night is about as uneven as a film can get. When it features great character actors like Perlman, Giancarlo Esposito, and Titus Welliver trash talking and telling sea stories, it is a lot of fun. Unfortunately, the vanilla Beau Mirchoff is no match for any of them, yet he carries the film’s dramatic load. He even takes their places on camera as he starts to envision their stories through his eyes. Still, there is a distinctive streak of pitch black humor running through the film. Francis also turns a few good twists, but he does not know when to stop. The ultimate ending (following several false stops) makes absolutely no sense within the film’s narrative context. Sensitive viewers should be further warned, Poker Night can get a little rough. Strictly speaking, it is more of a thriller than a horror film, but you can definitely see the Saw franchise from here. 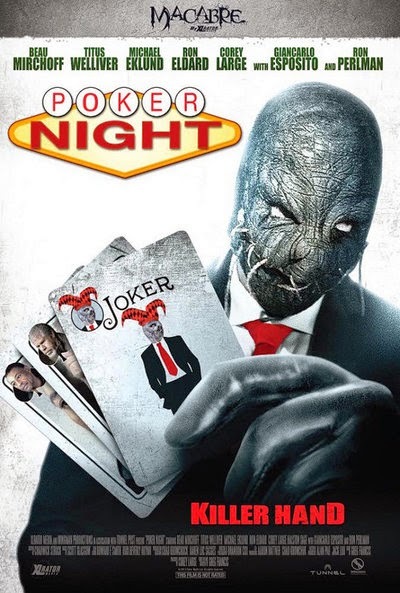 Arguably, Poker Night’s concept would work better as an ongoing television show than a one-shot feature. Each week, a different reminiscence could illuminate dumb plodding Jeter’s latest case. It would also force the showrunner to keep things more focused and grounded, which would be all to the good. Nevertheless, it is hard to get really down on any film that lets Perlman and Esposito do their thing. Strictly for the cult stars’ fans, Poker Night launches on VOD and opens simultaneously in limited release tomorrow (12/5).